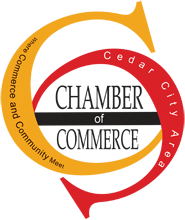 The Cedar City Chamber of Commerce provides a pro-business culture that helps create sustainable business environments/awareness/opportunities and creates mutually beneficial relationships. The Chamber of Commerce supports business opportunities, provides resources, fosters partnerships with member businesses and promotes a positive image for the business community. The president is Chris M McCormick.